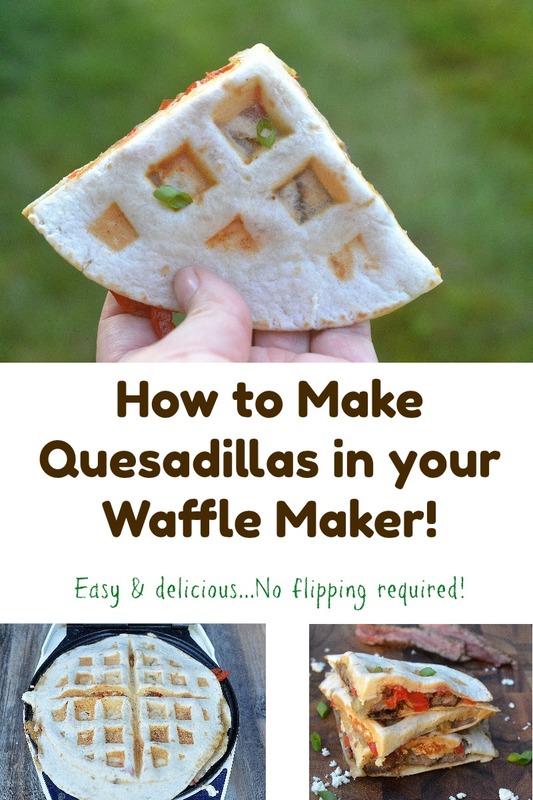 Today I am sharing how to make Steak Quesadillas in your waffle maker! 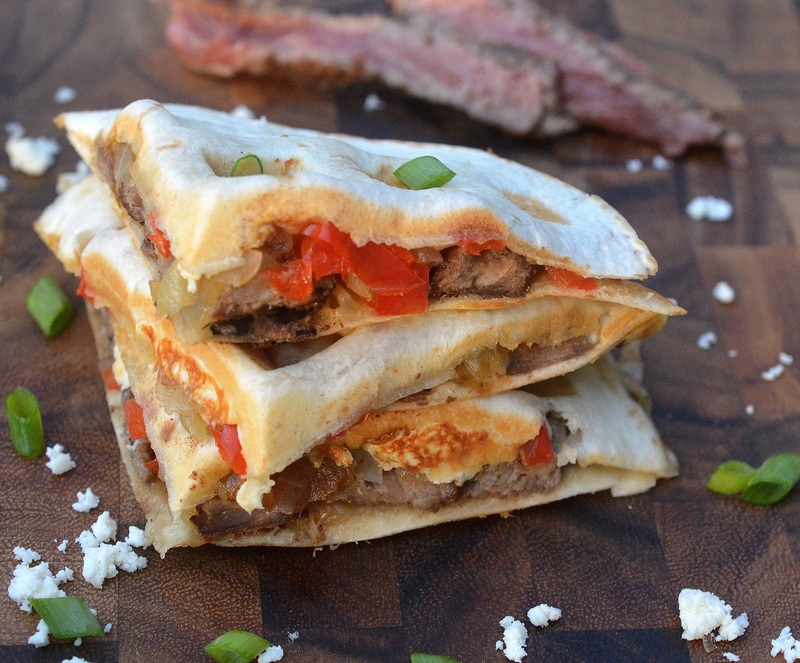 After making quesadillas this way years ago…I have never made them any other way! Making Steak Quesadillas in your waffle maker is SO easy and the best part is that the quesadillas come out perfect every time. Hot, cheesy and perfectly crisp where you want them to be. 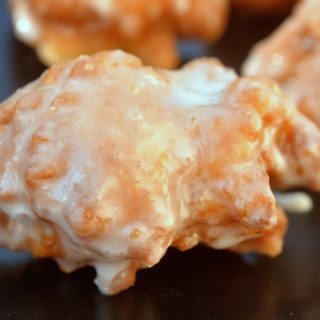 These are a favorite of my husband and son (and all of his teen buddies). When they know I plan on making quesadillas, they get very excited, lol! Once I fed 5 13-year-old boys these and they literally each ate 3 whole quesadillas! I was a quesadilla-making-machine! This is my second post in partnership series with Moyer Beef. 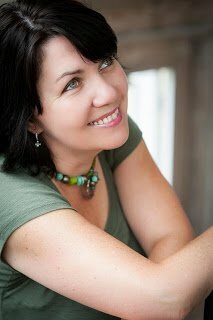 I enjoy partnering with brands I feel good about and creating recipes using their products. Moyer Beef, who is local to me here in Pennsylvania, Moyer Beef believes in providing families with fresh, locally produced beef every day. Moyer Beef is sourced from small family farms, who raise their cattle with care in the Northeast. Their products don’t travel far to reach their partner grocery stores, so they are always fresh. All of this makes me feel good about supporting this company and helping get the work out on their delicious beef. Moyer had been in the industry for 150 years for a reason! For this recipe, I chose to use Moyer Ribeye Steaks. 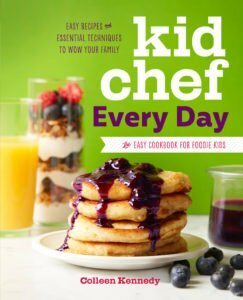 You can use whichever variety of steak you choose for this, I felt ribeye would give me the flavors and the texture I was looking for Steak Quesadillas in Your Waffle Maker. You can saute your veggies and cook your steak in advance if you like. The heat of the waffle iron will warm them up easily from room temperature to hot and delicious! Once you set up your ingredient area (your mies en plas) it’s a snap to assemble and cook the quesadillas…No flipping required! I actually have a few authentic Mexican Comals yet I prefer our quesadillas made this way. Beef, chicken or veggie…Give it a try! 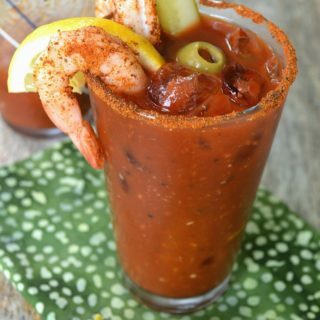 and if you do make these this way…show me show me show me!! Tag me on Instagram or Facebook @soufflebombay! 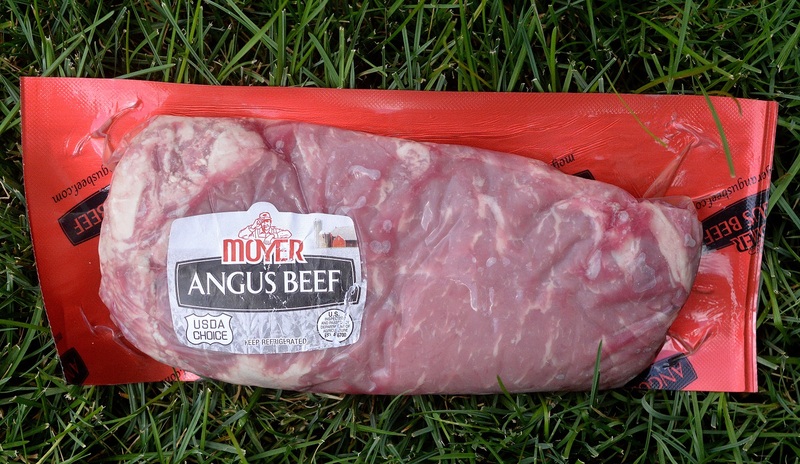 If you come across Moyer Beef at your grocer…Give them a try too. Their beef is delicious and you will be supporting family farmers, which I love! Moyer partners with over 4,000 small family farms across the Northeast. The farms each have small herds averaging 30 head of cattle each year on roughly 130-acre farms. Working together, Moyer is able to support the local economy, as well help ensure future generations of family farmers. Today My family and I enjoyed some grilled Moyer strips stead…They were SO, SO full of flavor…and it wasn’t me that did it, however, I will let my family this so, lol! You know how beef can be hit or miss with flavor?? Moyer so far in my experience has been spot on! Follow Moyer Beef on Facebook for news, specials, recipes and more! Cook your steak(s) to your liking, When making quesadillas I cook to just under medium. Choose to grill your steaks or pan fry. Be sure to season them well first. Allow steaks to rest before slicing. Saute your peppers and onions in butter, season well with salt and pepper as they cook. When ready to make quesadillas. Set up your ingredients in the line of order you will be adding them to the tortilla. It's efficient that way. Spray waffle iron with Pam or whatever you use and heat it until hot/ready. Once iron is ready, lay one tortilla on the griddle then sprinkle cheese, add beans, peppers & onions, steak slices and then add some more cheese (the same as you first did or mix it up with a second variety of cheese as suggested...no rules here). Top with the another tortilla gently close the waffle iron putting more and more pressure in it. Hold it closed for 30 seconds, pressing down where cool. Allow it to continue cooking another 3-3½ minutes or so, putting pressure on it every now and again. Once the tortilla looks done to your liking (with some brown or crisp edges/spots, get under it with a small metal spatula or butter knife and spatula and place it on a cutting board for a minute or two. Use a sharp chefs knife to cut it into 4 triangles right along the waffle marks. Don't "saw" it into quarters, press and roll your chefs knife to make a clean cut. 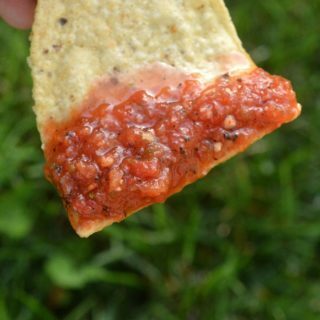 Serve with salsa and repeat until full. You can choose to use whichever type of steak you want for this. Cook to med or med-rare since steak will also cook a bit in your waffle maker. 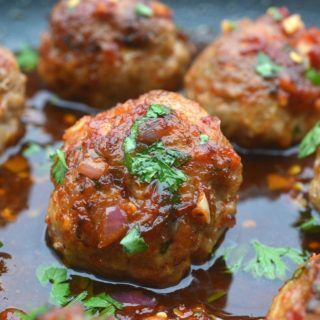 You can also make these with shredded rotisserie chicken, leftover chicken or with just veggies. You can cook the peppers & onions and steak a bit ahead of time if you like. Just bring to almost room temp when ready to assemble. I use a circular Belgian-style waffle iron. I love the idea of fresh, local beef! I love this idea! Now All I need is a round waffle maker! What a great idea, they look delicious! I can’t wait to try them out. What a creative idea! 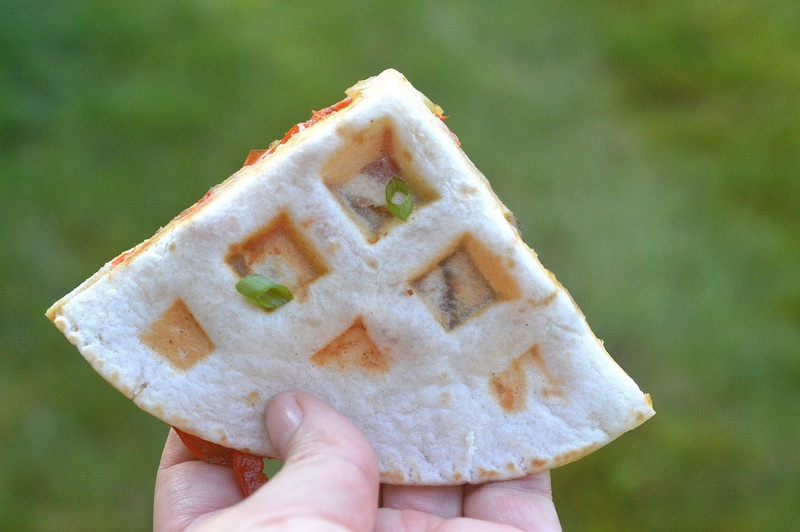 I’m going to start using my waffle maker to do all my pressed sandwiches!